Ken Mannion. 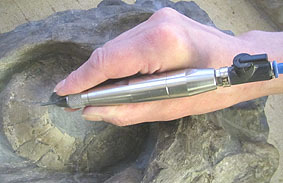 TT Fossil preparation Pen. Max blows per minute 13500. Air flow 1.1 cfm. Vibration level 4.2 m/s/s. Sound level 79 db. The TT Fossil Preparation Pen is deceptively powerful for its size, while being genuinely capable of truly fine finishing work, with a surprisingly meagre air consumption. It has a wide power range and is easily and instantly varied for close or fast work. 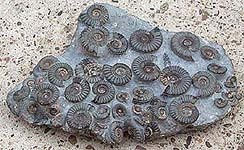 Evolved and produced by us specifically to meet the more demanding requirements of fossil preparation without compromise. 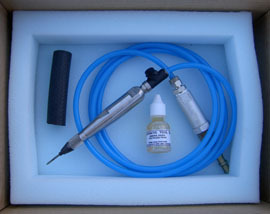 Far removed from a basic industrial air engraver that was often pressed into service in the past, it has a far superior versatility and flexibility to produce the best fossil results. A considerably robust stylus with a 2mm diameter tungsten carbide at the tip, for an extremely long life, in a grade suited to working with stone. A refined nose, in hardened steel, gives great support to the stylus, enabling matrix removal at the finest level to be maintained. Fossil prep typically is done with the pen at a more acute angle increasing considerably the side load on this critical part. A main body made from stainless steel, with a good ergonomic grip, giving better control for both detailed work and fast matrix removal at fossil preparation angles and applications. Lever switch for easier power control, and a lighter hose that can be easily adjusted for length. Hand made here, we have 100% quality control and 100% total spares backup and service support. 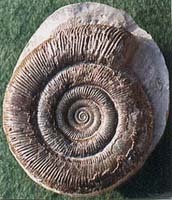 The Eye of an Ichthyosaur being revealed, a multi block of Arnioceras Ammonites and a Dactylioceras Ammonite.